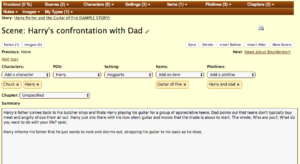 I'm Mike Fleming, creator of Hiveword which is a web-based novel organizer. I also created Knockout Novel with @jamesscottbell which is a set of interactive writing prompts as well as the Writer's Knowledge Base which is a searchable collection of @elizabethscraig's writing links. This blog focuses on how writers can leverage technology to make their writing experience better, faster, or simply more fun. I’ll just mention a quick tidbit from the Hive because I want to get right to the interview since it’s so amazing. The Writer’s Knowledge Base (WKB) has articles from over 4,000 websites. All hand-picked by Elizabeth Spann Craig. 4,000! Crazy, isn’t it? I thought it would be fun to list the top ten sites with the most content in the WKB. You’ll find them here. A new one is added to the list every day until we get to the top spot. And don’t forget that you can get daily or weekly emails with categorized links to great articles on writing via the WKB email service. Ok, enough of that. Let’s dive into the interview. I first learned of Dennis Doty’s take on short stories via Jeremy Menefee’s blog post. My jaw dropped at the insights contained there. While Dennis was anonymous in Jeremy’s post I knew I had to talk to “D” and get some more info. Thankfully, Jeremy was willing to connect me to “D” and Dennis himself was game for an interview. I hope you find as much value here as I did. When did you start writing, Dennis? My first published byline was an article in a local newspaper in 1989 followed by another in a local business journal in 1990. After that I didn’t write until I took up fiction in 2004 and honestly didn’t pursue it regularly until the fall of 2015. With the lure of writing novels, how did you arrive at your approach of learning the craft via short stories? In other words, what was the “A-ha!” moment? The “A-ha” moment came after I set out on this path, in fact, around the time I started my freelance editing. I started out writing short stories. I never was a believer in starting out with an Iron Man event. I think that it’s best to first learn to swim, ride a bike and run a foot race. Short stories are the means I’ve taken to learn the skills needed in writing a novel. I realized with my freelancing, how many pitfalls in writing I had avoided and how fortunate I had been in having to face the rejection of only a few hours work instead of months or even years. What makes writing short stories so great for learning? 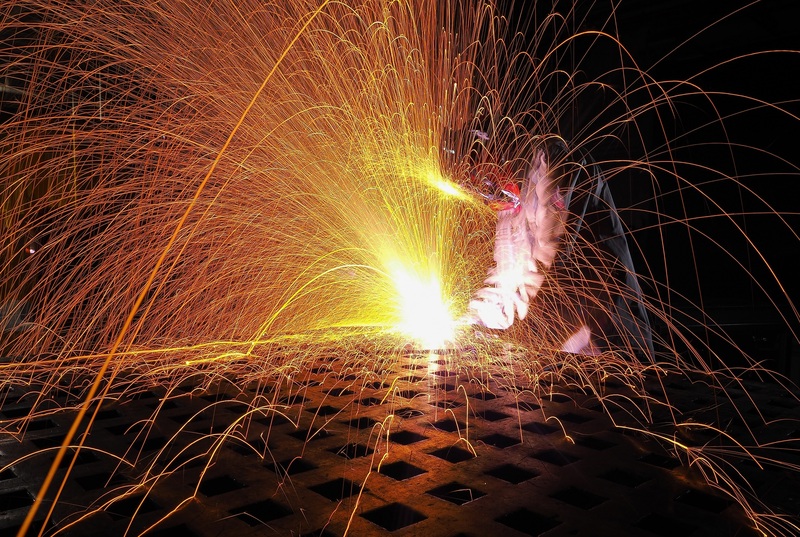 It was only after I had begun to really perfect my craft that I came to realize how fortunate I had been. All stories, whether long or short form require a beginning with a solid hook, a middle with plot and character development, and a satisfying denouement. Several successful writers have mentioned that it takes somewhere around a half-million words to become proficient at the craft. For a novelist, that’s around six books. For a short-story writer, the same word-count will produce around two-hundred stories. It’s easy to see that our novelist friend will have written six solid hooks, six good plots, and six satisfying endings and it will have taken him roughly three years to do so. A short-story writer, in the same half-million words, will have produced roughly two-hundred stories of magazine length, each with a hook, a body and an ending. Not only, does the short story writer get more practice on the essentials, but he or she is certainly going to have a much easier time finding beta readers willing to give honest feedback and help him or her improve their art. I’m a pantser. With short stories, I often have an idea in my mind of where I want to begin and how the story will end, and sometimes it follows that intended course. When I sat down to write my first novel, all I knew was what kind of a man my MC was, and that he was coming home from war to a world that was forever changed. That story ended up taking turns I didn’t expect and the finished first draft was a hot mess of two stories combined. I’m just now experimenting with some hybrid forms to see if I can’t write from some kind of an outline for novelette and longer works. I think that’s just another skill I need to develop. What makes short stories great from a business perspective? Without getting into the pros and cons of Indie versus Traditional publishing, let’s assume that both the novelist and the short story writer I mentioned before decide to go Indie. Let’s just go with six self-published novels and two-hundred self-published short stories. Our novelist will put his work on Amazon priced at $14.95 per copy. Our short story writer will likely offer his work at $1.99. Sales won’t be great for either until they have amassed a body of work, but suffice it to say that our short story writer is going to reach that magic number of titles a lot sooner where his backlist begins to sell his front list. Looking only at sales and profitability, let’s assume that both sell exactly one copy of each title. Our novelist sells all six titles at list and earns $53.82 after paying twenty percent for printing and another twenty percent for distribution. Our short story writer sells all two-hundred titles in ebook format only at $1.99 each, and releases four collections with twenty-five stories each at $15.95 in paperback. Selling only one copy of each story and one of each collection, our short story writer will earn twenty percent on his ebooks and sixty percent on his paperback collections for a total of $117.88. They’ve both written the same number of words over the same length of time, but the short story writer has earned twice as much money for his effort. Additionally, if a title doesn’t sell or is a slow mover, he has significantly reduced his risk because he is more diversified. Was the business side of short stories an afterthought or calculated in advance? Totally an afterthought for me, but one that I have blogged about and highly recommend to writers whom I edit or mentor. Where can we find your stories? My first published short story was in the anthology, “A Journey of Words” by Scout Media. I currently have a story, “White Buffalo Woman”, appearing in the Spring issue of “Saddlebag Dispatches” and they’ve accepted another for a future issue. Likewise, my story “The Snow Bride” will be appearing in the Summer issue of Cheapjack Pulp. I’ve posted a couple of stories and essays in my blog and elsewhere on my webpage at www.dennisdotywebsite.com as well as on my author page at www.facebook.com/authordennisdoty1. As I mentioned, the first novel was somewhat of a hot mess and is temporarily relegated to the rewrite file. I’ll get back to it, but it isn’t a priority right now. Oghma Creative Media who owns Galway Press the publisher of Saddlebag Dispatches has asked to see any short stories or book proposals I wish to submit. I can’t tell you how good that feels, as well as how validating to my process. After discussing it with them, we agreed that I would stick to my plan to write a minimum of two dozen short stories this year while working on a novel in between. In addition to the first novel which will eventually evolve into two separate novels with the same main character, I have a Western/Fantasy novel currently around 20,000 words. I’m doing some world-building for it, and there’s a third traditional western which I have three complete chapters done and is going well. I think I can work it in between short stories and have it complete and ready to submit by late fall of this year. Is there anything you wish I had asked? In addition to my own writing, I do freelance line editing and proofreading and I co-administer a writing group on Facebook. It’s a small group of less than one-hundred members who are serious about learning the craft and we work hard to mentor them and help improve their writing. One of the ways that we do this is with a regular feature of the group called Friday Flash Fiction Challenge. We give a prompt which may be a title, a theme or a character and they have two weeks to write a story of 750 words or less and submit to the admins. Each submission gets a professional acceptance or rejection letter just like they would in the real world. This helps them get over the fear of rejection which holds so many writers back. Every story gets feedback from each of the admins. We also select a winner who gets to choose a writing related ebook from a list of titles available on Amazon and a runner-up who gets a free professional edit on their story. We’ve only been doing this for about six months, and already, three of those stories have been accepted for real world publication. I’m as proud of their achievements as I am of my own – maybe more. If any of your readers are interested in such a group they can feel free to contact me by PM or email from my website. You may have noticed that it’s been unnaturally quiet around here. There’s been a dearth of new feature announcements, tweets, blog and Facebook posts, etc. What’s going on? Hiveword newsletter subscribers know what’s going on. Be sure to subscribe to the newsletter if you want the freshest news. I suppose the title of this post is a spoiler but today I’m going to talk about the long overdue Hiveword redesign. What follows is the content from a past newsletter describing the changes. In the last newsletter I mentioned the Hiveword redesign that is underway. In this edition I have some screenshots for you! My goal with the redesign is to make Hiveword prettier, mobile-ready, streamlined, and more amenable to adding new features without having to bolt things on like some sort of novel organizer Frankenstein. Ouch. That’s what you call a screen only a design-challenged programmer could love. 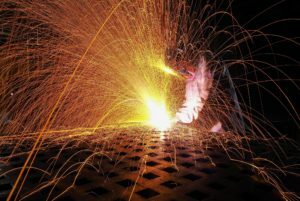 To its credit, it is easy to figure out how to use, busy though it may be. Now, you won’t mistake this page for something designed by Apple but I hope you’ll agree that it’s considerably easier on the eyes. Plus, there are some huge changes here. 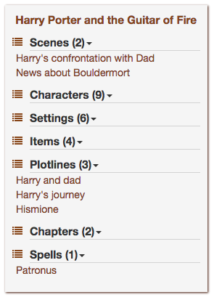 The screen is now divided into three sections: story navigation, core details, and metadata. Let’s look at each of these in turn. In the current Hiveword design, the story navigation is presented horizontally at the top. There is no room for expansion. If you’re a Hiveword Plus user you’re blessed with a SECOND level of navigation as seen in the first screenshot. This needed fixing. Desperately. 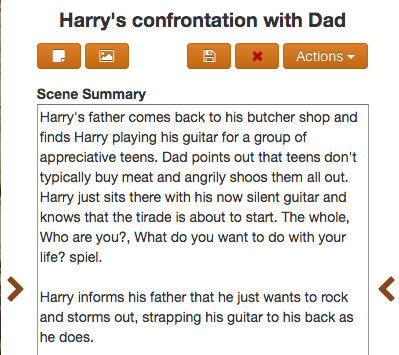 This section will appear on all story component pages such as scenes, characters, etc. The vertical orientation provides room to grow. Plus, the sections stay open between pages however you have them set. For Hiveword Plus users, your custom types are now seamlessly embedded in the story navigation. In the screenshot, Spells is a custom type and Patronus is a definition of a spell. Because each item is a link it’s easy to get to wherever you need to go. The little list icon in the section headers takes you to the list page of that thing (such as the scenes list page). 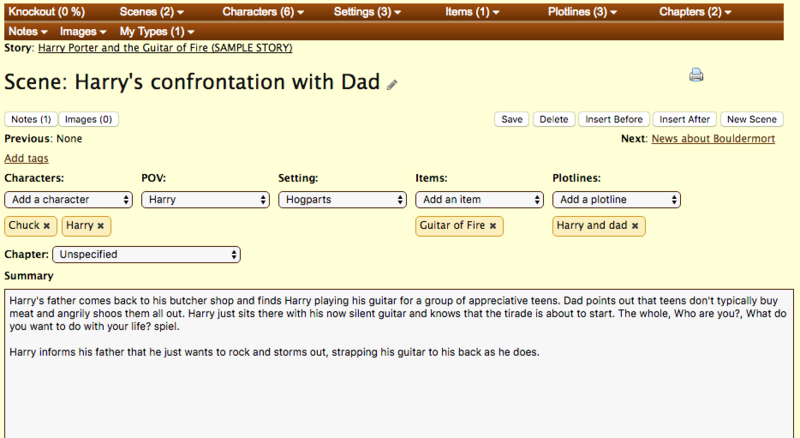 The next section contains the fields for the story component (i.e., scene, character, etc.). The main section offers a much cleaner look and is straightforward. The Save and Delete buttons do what you’d expect. Notes and Images are Hiveword Plus features and will work like before. That is, they’ll pop open in their own embedded sections of the page. You can change the scene name by clicking on it. This is also the same as the existing design. The other bits of metadata work the same way. Simply click on the arrows to slide in the section and then dismiss it when done. So, there you go. Now you know that there’s a huge redesign effort underway. Do you like what you’re seeing so far? Any wishes or other feedback? Hit me up in the comments below or via the various other methods you can find here. Time for me to get back to work! 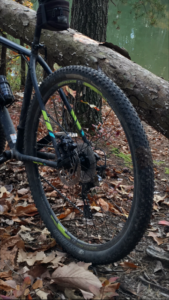 In biking, the lowest gear is called “granny gear” or simply “granny.” This gear is so easy to pedal that it pretty much requires no work. However, you won’t get anywhere fast when you’re in granny gear even though your legs are spinning like mad. 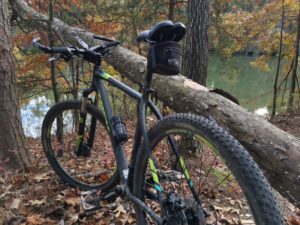 Since I got my new bike last year (pictured), I find myself riding a higher gear than I used to on my previous bike, Old Yeller. Old Yeller was a much harsher ride than my new bike, Black Betty (bam ba lam). By the way, you get extra points for knowing the Black Betty reference. Black Betty is a dream to ride. It’s SO easy. Effortless, almost, especially compared to Old Yeller when after a ride I would feel like I had been jumped and beaten by a band of merciless woods pirates or something. And while I’m not in granny gear I did find a sweet spot where I can just cruise all day. But, I noticed a problem: I wasn’t getting stronger. Then I got to thinking, what else in my life can I apply this concept to? Programming, relationships, learning something new… Whatever it is, I’ll get better at it or perhaps get more fulfillment if I just upshift. Just one step — it doesn’t have to be a huge leap — and I’ll get better incrementally over time. It’s a bit of a mental game, too, since one little gear doesn’t seem like too much to ask. I know, I know… All of this is common sense. But, sometimes I need reminders, common sense or not. Is there something in your life where upshifting would make you stronger/better? The following is part of my Mountain Biker Musings collection. 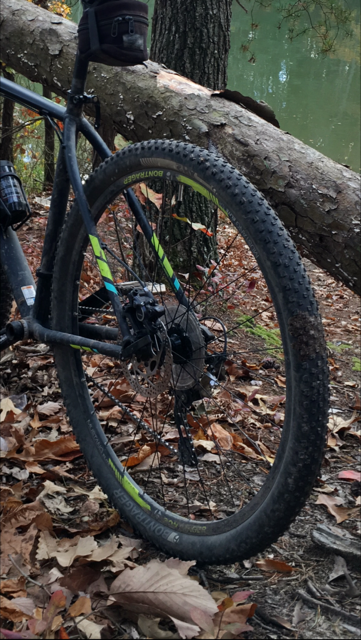 I use a biking metaphor here but I think it applies to any endeavor. I hope you like it. Hey, you’re doing great right now! How about one more now? One more pedal stroke and, well, look at that, it’s now! In this post I’ll describe some improvements to the “My Types” menu. It’s not terribly exciting like the last two features but I think it is a nice usability change. If you have Hiveword Plus (the upgrade to the free Hiveword plan with a two week trial) then you know about Custom Types and Fields. With this capability you can add your own fields to characters, scenes, etc., and you can also add new things (types) to track such as Spells, Spaceships, etc. When you define a custom type you get to add all of the fields you want to describe it. You can see that it’s right there with the other type menus such as Scenes. You can also see that there are two types defined. Now we can see the two sorted custom types, Spells and Wands. 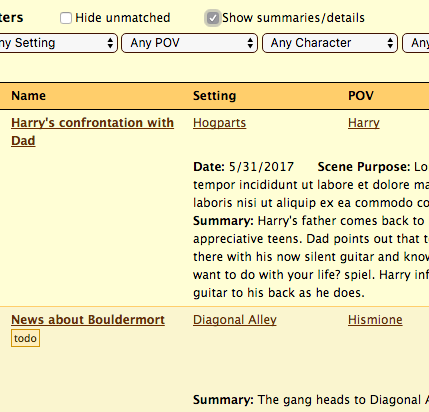 There are two spells defined in the story but no wands yet. This part hasn’t changed but the other parts of the expanded menu are new. The “Manage types and fields” menu item takes you to the Custom Types and Fields management page. This saves a click because before you’d have to click on the Dashboard link or Hiveword logo to get to the Dashboard page and from there select the “Types and Fields” menu. Too much work! 😉 Now, you can get there easily. There are now three icons for each type: Add, List, and Sort. Clicking on one will do that function assuming it’s not disabled (grayed out). Before, these functions were accessible via a third-level menu which required too much dexterity. It’s much easier now. Finally, the entire list will scroll, if necessary, rather than having an extremely long dropdown menu. In this example, no scrolling is necessary because there are only two types. I hope you find this tweak to be more user-friendly than before. As usual, I’d love to hear your thoughts on this or anything Hiveword-related. Thanks to Darren B. for making many of the suggestions for the changes mentioned in the last several posts. In my previous post I talked about the icon on the right below and that it toggles the default Hiveword fields off and on if you have custom fields. I also teased the new icon to the left of it. These new icons appear on the edit pages for characters, scenes, etc. This post is about the icon on the left. This icon toggles the display of custom field descriptions if any are provided. The icon won’t appear if there are no custom fields with descriptions. The show/hide description toggle works like the show/hide custom fields icon next to it: namely, the setting is remembered across sessions. 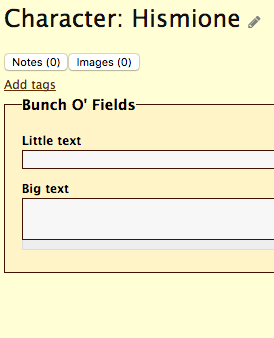 The field “Little text” is in a category called “Bunch O’ Fields.” Who names these things?! 😉 Categories are logical groupings of related fields. You can see that the category as a whole can have a description that encompasses all of the fields within it. Finally, the Intro and Outro categories demonstrate that you can arbitrarily place text-only sections. Note that in the screenshot without descriptions the Intro and Outro are not displayed. The reason is that they are pure description (that is, the categories have no fields) so they get hidden. Field descriptions are optional. I recommend keeping your field names short and using the description to explain it in further detail if it warrants explanation. If you’ve used custom fields before you know that you’ve always had the option to add descriptions where the fields are defined. What’s new here is that the descriptions are used right within the page where the custom fields are being used such as a character page or within your own custom type. This set of custom field definitions matches the screenshots above. The field description capability discussed here is part of the Custom Types and Fields feature available in Hiveword Plus which is the upgrade to the free Hiveword plan. There’s a 14 day free trial so you can try it with no risk. I hope you like this new feature. I’d love to here your ideas for how you plan on using it! 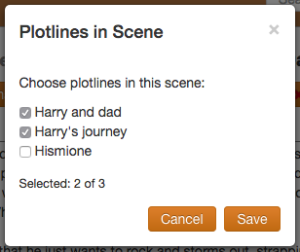 In Hiveword Plus you can add custom fields to the “factory” or default types such as scenes, characters, etc. Your custom fields display above the factory fields under the assumption that, since you added them, they must be pretty important. 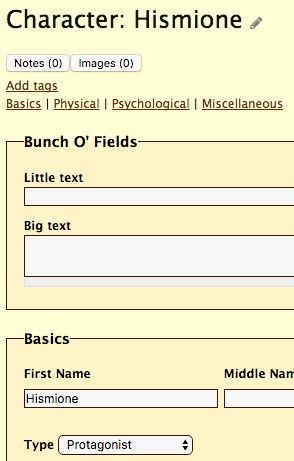 The “Bunch O’ Fields” section is custom, obviously, and the default fields start with the Basic section. The icon that looks like a piece of paper will be the subject of my next post but clicking the factory icon will toggle the factory fields off and on. This setting will be remembered for all types and across sessions so you can set it and forget it. Furthermore, the icon will only appear if there are custom fields. To my knowledge, no other novel organizer offers this level of flexibility. Besides custom types and fields, the Hiveword Plus upgrade offers the ability to add notes and images to everything, a journal, and the ability to search everything. It has a 14 day trial so you can kick the tires. Try it today! Quiescent. What a fun word. Quiescent is what this blog has been over the summer. But, as everybody knows, winter is coming so I have a flurry of blog posts planned about recent additions to Hiveword. Today I’m going to talk about the new show/hide details toggle on list views. While this feature won’t save the world it will reduce scrolling for serious Hiveword users. 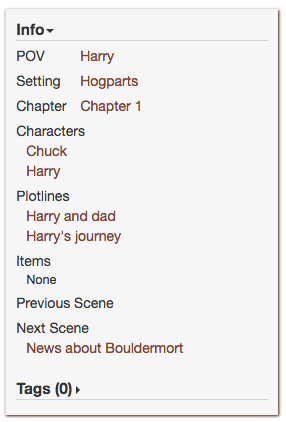 Previously, only the story, scene, and chapter lists had a summary/details toggle. Those lists try to convey a lot of information at once and the toggle on those pages is for adding data (the summary, actually) to each row. These toggles have not changed. 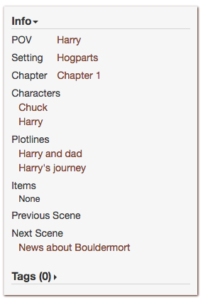 The remaining list pages are for characters, settings, items, and plotlines. These lists now have a toggle to hide information. Why? Because if you have a lot of these things the list can get very long which requires you to scroll to find the character, setting, or whatever it is that you are looking for. Hiding the details compresses the list. If you’re a Hiveword Basic (the free plan) user then the problem is most evident on the character list page. You’re likely to have a lot of characters and if you’ve filled in a bunch of fields the details column can make the rows fairly tall which means more scrolling. Hiding the details will compress the rows. If you’re a Hiveword Plus user the problem can be even worse if you’ve added custom fields to the characters, for example. 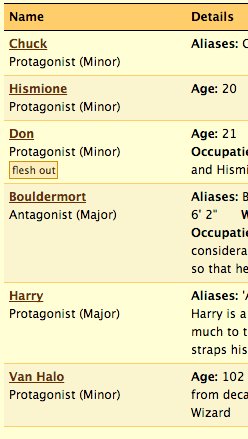 In Hiveword Basic, only a subset of character fields are displayed in the details column. Hiveword Plus users see this data along with any custom fields they’ve added under the assumption that a custom field must be important. Hiveword has no way of knowing. So, with custom fields, the rows can get really tall. Hiveword user Matt N. requested that extension fields be included on the various list views. This feature is now live and affects both the basic and Plus versions of Hiveword. Hiveword Plus has a feature called Custom Fields and Types. A better name might be Custom Templates. To my knowledge, this level of customizability is unique to Hiveword. Anyway, with this feature you can create new classes of things to track such as spells, spaceships, etc. But, you can all extend the factory types such as scenes, characters, etc. 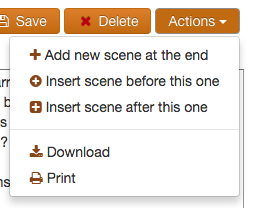 For example, you could add “Date” and “Scene Purpose” fields to the scene detail page if you wanted. Prior to today’s change, you wouldn’t see your two new fields on the scene list view. Now you can! 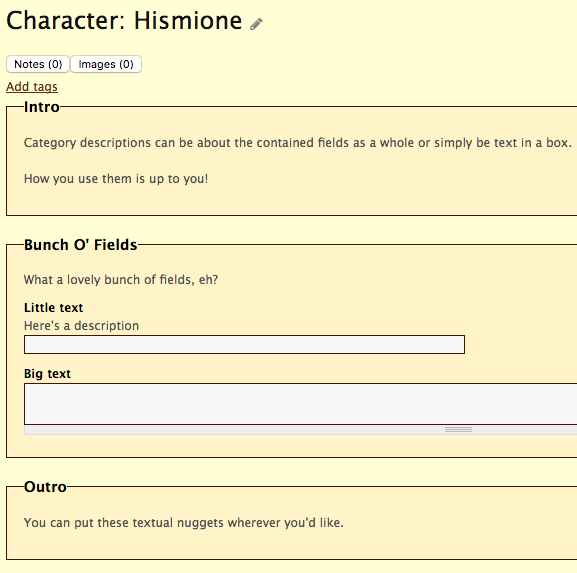 Here, the custom field is Role and the character Hismione has an entry for it. You can see how the custom and factory fields are seamlessly displayed together. While doing this work I revamped some things for consistency. These changes may affect you even if you are not a Hiveword Plus user. For example, the story list page now allows you to optionally display the story summary in the list. Another example is the settings list. It used to have columns for City, State, and Country. Now, there is one column but the data is displayed in a fashion consistent with the other lists. So, if you never supply data for the State field, space will not be taken up with the placeholder for it. I hope you like these tweaks. I think the changes are nice because it concisely presents relevant information without having to drill down to details all the time. Thanks for the idea, Matt! 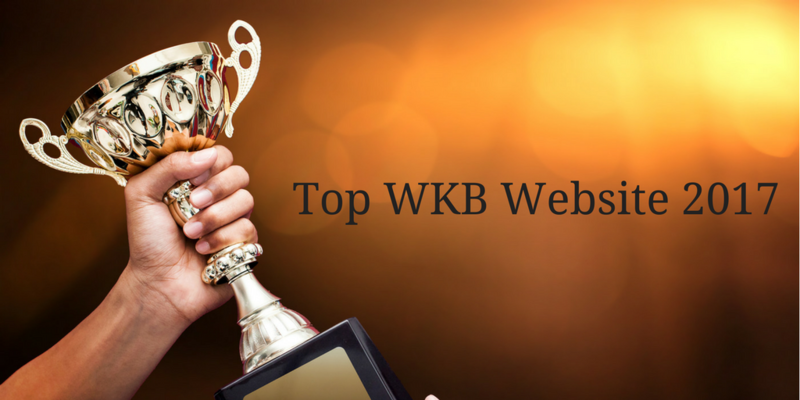 There are over 4,000 unique websites represented in the WKB. That’s a lot! The ones that have the most articles are something special. So, for fun, I’m running a countdown of the top 10 sites at https://hiveword.com/wkb/topSites. Check it out!